Why is it so special the Lladro porcelain figurine of this article? The figurine of the group of giraffes discuss in this article is very special, not only for the fact of been made in the first period of the company Lladro, so it is because it belongs to the privileged group of figurines under the list of pre-production. In addition, we can say, it is a porcelain figurine very difficult to find because of the low number of figurines that were performed. It is a figurine for authentic collectors. For lovers of rare and very antique figurines of Lladro. The motive of the porcelain or the degree of artistic level takes second place, because what really matters is to possess the rare piece, because having it means, to know, that you belong to the rare group of the world with the luck of owning a Very little treasure. Despite this, and although we are aware that technology has improved very significantly, in the fact to develop these porcelain figurines, the artistic level and manual of that time was very high level. What kind of mark does these porcelains have? The mark of these porcelains was not the typical blue print seal at the base; marks were printed on the bottom, with the Lladro name or by two vertical parallel lines intersected by other two horizontal parallel lines. Why Cocowif has many old, rare and retired figurines of porcelain Lladro? My father, Jesus Rojo, is the main reason. His hobby has always been to find and get porcelain figurines from the first time; special figurines, the rarest. Thus, gradually, the collection began to grow and grow, getting specialized in retired and first period figurines and being, actually, a world reference in the second hand market of figurines of lladro. 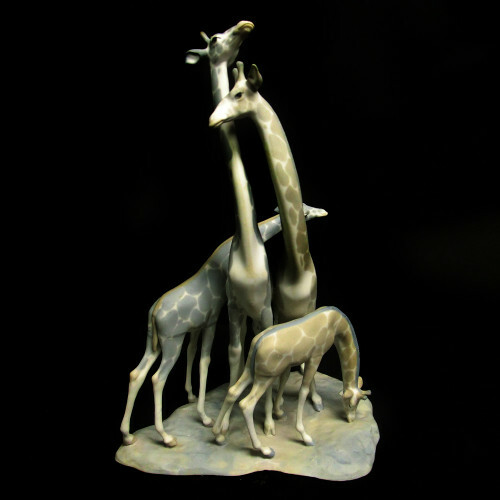 The figurine, group of giraffes, reference number 1000113.06, was developed in 1958 and not long left to be performed, hence the shortage of this product. The economic value of these figurines is subjective, but the company Cocowif, try to give a value accordingly depending on the number of porcelains made, period, demand, economic situation and other factors. Do not hesitate to ask any topic related to retired or discontinued figurines of Lladro porcelain.